This book is a celebration of good food. It also reveals a love of cooking by an author who for many years has conducted a passionate affair with his household's kitchen stove. No one has minded so far - not even his wife, who happily allows him to hold sway as the regular family cook. This book is not a cookbook in the usual sense, rather more an assembly of best-loved recipes collected across the years from various acknowledged sources. The author is certainly not a professional cook - though at some time in the last century he won a competition run by the BBC to recreate 'the taste of Italy' on a plate - judged by top chef Antonio Carluccio. So why 'Dog's Dinners'? Many will know the author as an actor simply for his role as the voice and soul of the robot 'dog' K9 in Doctor Who - hence the punning title; others will know John as a wine educator and wine writer. Maybe both have something of a pedigree! 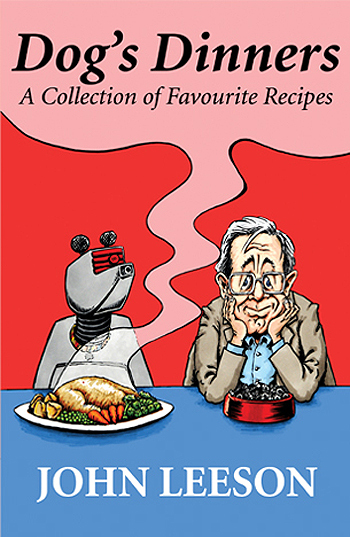 The book is a taste-bud tickler and, who knows, it might be a spur to your own experimentation in the kitchen. So put on your apron! Arthur Daley's immortal misquote in television's Minder series: "The world is your lobster" is the key to it all!